It usually doesn’t matter if the trip is leisure or business, most people give up on their healthy eating and exercise habits. With either the constant rush of things, new excitements or even locations we are often challenged with either food choices or staying active and exercising while traveling. Depending on where you are traveling and for how long, you can consider buying some of these upon arrival. For instance when we travel to India we usually wait and buy some wheatgrass powder, spirulina, etc. once we arrive, it’s usually cheaper and you don’t have to transport it. Flight Meal – One of the first things you should do before you head off on your trip is to call the airline or go online and choose your meal. Airlines are usually quite accommodating if you notify them of your restrictions. However keep in mind it’s not a bad idea to double check your meal choice when you are checking in at the airport. If for some reason there are not many options or an issue with it once you are in air – simply request some fruit or something. Mini Fridge – If you plan to be staying at a hotel call ahead and confirm or request a mini fridge in your room. This way once you arrive you can do a little grocery shopping to help save money on restaurants and the chance of eating “junk”. Do your homework before you depart. Check out the area you will be staying and what options there are for groceries, health stores etc. (I even look to see if there’s farmers markets). How is it prepared? Is it fried, baked, grilled, steamed…? Request to have it prepared as you like. Can I have the dressing on the side? Request any dressing or sauces etc. on the side so you can control the amount. Can you substitute salad or veggies instead of fries? Most places have no issue doing this, you just have to ask. Do you have wholegrain? Whether it is a bread basket, sandwich, pasta etc. check and see what your options are. This is a good question if a concern before you even settle at a table. TIP: Before going into any restaurant always ask to see a menu first – see what your options are and if you think you will be able to find something. This way you don’t feel obligated to order something because you are seated and it not suit your health needs. Simply Order Fruits and veggies whenever you can. This way you have more of an understanding and control of what you are eating. Just make sure that the fruit is not served in a syrup or the veggies are not too oily etc. Just ask… or buy fresh from a market or grocery store. Make sure you hydrate before you are trapped in a car for hours or on a flight. Why? Drinking water before a trip hydrates your skin, oxygenates your muscles, and regulates your bodily fluids, alleviating swelling and liquid retention. Avoid sugary drinks and alcoholic drinks when possible. Especially if you are in heat – opt for water at all times. Also if you find you lose your appetite due to heat eat high water content fruits like watermelon, cantaloupes etc. 7. Stuck at the Airport? Scope it out – Walk around to see what food choices you have before just buying something, especially if you have the time. Plus the walking will be nice before you board a plane. If you are having a hard time finding something there are usually places that sell just fruit – like whole apples or bananas (tip: starbucks always has bananas). Check out the magazine stands and convenience stores for nut mixes or granola bars etc. Exercise wise – a great tip to kill time if you have a layover… do some yoga (if you travel with your mat) or simply do some stretches. If you really wanna make use of your time when Zuz and I had a layover in Tokyo we say a kid walking backwards one the moving “moving walkways” BRILLIANT! Bascially it becomes a treadmill 🙂 Obviously use caution and don’t choose a busy one. Share Meals – This is great if you are eating out. Helps save money and keeps your meal on the lighter side especially on those days when you may not be as active. Juice Day – This is great if you are at a resort or something… just lounging by the pool. Provides you nutrients that you need, and gives your digestive system a break and its great because most places provide fresh juices. Otherwise don’t be afraid to drink just water maybe throw in one coconut water. We underestimate our ability to survive on water. Our mind tells us that we constantly need food. However if you are like me and staying somewhere really warm some days you just don’t have an appetite so stick to juices or water. Eat breakfast for dinner – be open to the idea that maybe one night maybe you eat oatmeal for breakfast or just fruit. All of these are probably unusual to your daily routine – be okay with that. So often we don’t realize how we are controlled by time and food. Oh its 12pm… lunch time. It doesn’t have to be like this if you are on holidays – time should not be an issue. Thats the best part you now can LISTEN TO YOUR BODY! Eat when you are hungry, stop when you are comfortable. 9. Leave the “I’m On Holidays” attitude at home! So many people use this excuse – don’t! If anything use your traveling as an opportunity to be healthier with your food choices and with your fitness. Again, you now have the time to actually focus on you and you. Don’t go crazy with alcohol just because you are “relaxing” or because it is included – use this as a test for your willpower 🙂 This applies to buffets as well! While you are commuting choose stairs over escalators when you can. Walk everywhere if it is possible. If you are at a hotel or resort take advantage of the gym/pool or search for local options. I mean if Zuz and I could find a gym while we were in India you should not have an issue. Choose activities to see the sites that will keep you active – hikes, kayak, swim, or learn something new like surfing etc. Pack with you an exercise band and skipping rope. Both are super compact, you can fold them up and place it in your carry-on,for a quick HIIT workout. 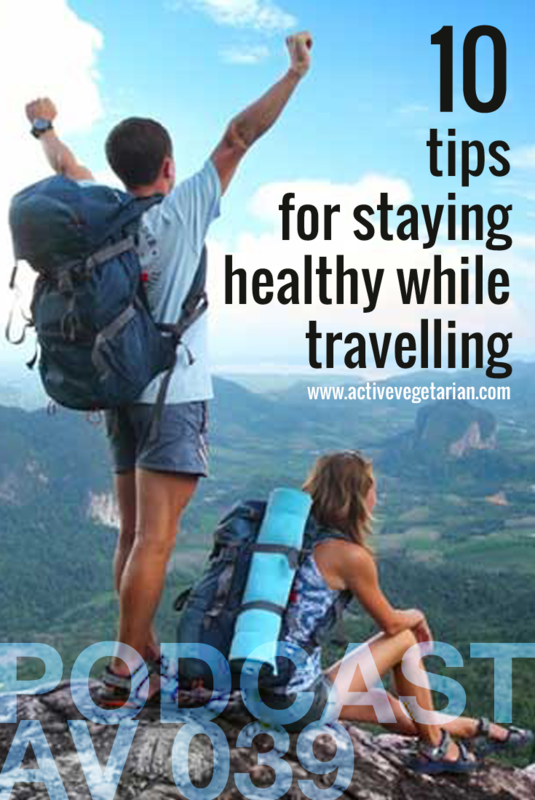 I hope this helps you to stay sane and healthy during your next trip. Now we’d like to hear from you. What are your top travel tips?